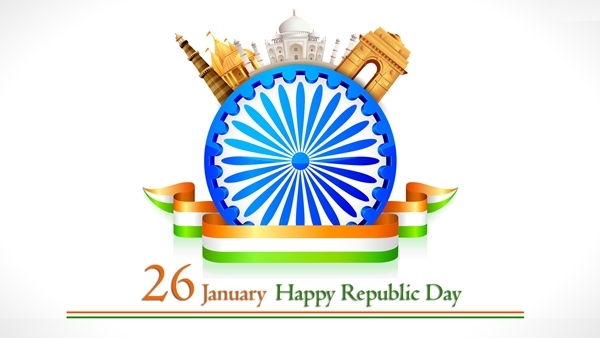 Happy Republic Day Date 2019 in India: India celebrated its 68th republic day this year. Marked on the 26th of the January, republic day honors the constitution of India that came into force in the year 1950. It is celebrated as the national festival every year with great pomp and show. Since, India was running on the rules implemented by the British constitution before the independence, the newly sketched Indian constitution by the Indian constituent assembly declared the country as republic thereby proclaiming democracy. The commemoration ceremony has always seen some of the renowned names of the world as the chief guest. A representation of the vast cultural diversity is witnessed in the traditional march on Rajpath. The word republic is derived from the Latin word ‘Res respublica’ meaning a country/stat where the power rest in the hands of its people and an elected representative serves the country on the principles of sovereignty. After the tireless efforts of Bhim Rao Ambedkar, the father of Indian constitution, in drafting the Indian constitution, India became republic in its true sense. The independence to the country brought a sense of pride to its people as it was the end result of numerous struggles and hundreds of obstacles faced by the freedom fighters. It is the day to feel proud of the diverse Indian culture, the multitudinous languages, societies and religions served in the single platter. It is one of those significant occasions which bring all the residents of the nation together to revitalize the feeling of nationalism within them. Indeed it would be unjust not to celebrate the day which gave us the space and freedom to breathe in the free air, to move where the heart wants and to introduce ourselves as a part of one the world’s largest sovereign nation. India was declared as a free nation on 15th august 1947. After a long period of campaigning, struggle, the country finally attained liberty. It was a subjugated nation back then under the colonial rule where Indians were treated in the most disgusted manner. Under the leadership of Jawaharlal Nehru and Rajendra Prasad, who became the first prime minister and president of the independent nation respectively, a need of a well developed system to run the functioning of the country was felt. The country could not progress under the baseless policies of the British constitution. After a series of meetings held among the political leaders, a drafting committee, formulated on august 29, 1947, under the leadership of bhim rao Ambedkar, submitted the sketch on November 4, 1947. After getting tagged as unsatisfactory, Ambedkar took a span of more than two years to make a lot of amendments in the draft. After inducing approximately 2000 changes, the final copy of the draft was submitted on 26 November 1949. After getting passed by the constituent assembly, finally the Indian constitution was brought into execution on 26th January 1950 making India as a ‘Purna Swaraj Nation’. It thereby gave the citizens to elect their own government. The rich history and a glorious background of the nations give a big reason to celebrate the republic day. How is it celebrated all across the country? The government of India declared 26th January as the gazetted holiday which is celebrated at a great platform all across the country. The enthusiasm among the people is worth a sight. Celebrated to commemorate the constitutional enforcement, the tri-color flag is hosted at Rajpath in the presence of the president the country. The efforts of the individuals as well as the government are evident from the well organized grand military parade held in the national capital of India. All the colors of the country are brought together to present a beautiful image of diverse cultures and traditions. Traditional forms of the dances are presented. The representatives of the Indian army, naval force and the air force participate in the traditional march past which is held in front of the India gate in New Delhi. At the national level, the celebration commences by offering of the garland at the amar jawan jyoti, India Gate. The action intents to honor the sacrifices of the Indian soldiers during the freedom struggle. The president of India takes the military salute afterwards whereas the state governors take hold off this responsibility in various states. The brave soldiers of the army, the students and the achievers are felicitated by the national awards like Vir chakra, paramvir chakra, ashok chakra and mahaveer chakra. Rose petal shower by the helicopters parading the area above the India gate captures all the attention of the audience. The exciting and thrilling performances by the school children are indisputably fantastic. The moment of the day is made by the fighter planes that parade in the air to emit smoke to form the Indian flag. This is their way to honor the respected president of India. In schools and colleges, cultural programs are conducted, national anthem is sung and sweets are distributed to celebrate the day in their own personal way. All the government and non government organizations remain shut. No banks or post offices work either on this day. The security system is improved to avoid any kind of mishappening. • The first draft of the Indian constitution was handwritten by Prem Behari Narain Raizada which exhibited exotic calligraphy skills. • Exceptionally talented artists from shantinekatan worked amazingly to decorate very page of the constitution. • The constitution was signed by exactly 283 members of the constituent assembly. • Divided into 25 parts, the constitution contains 448 articles and 12 schedules thereby making it the longest constitution of the world. Also the uniqueness it carries because of it being handwritten in commendable. • The helium filled cases kept in the library of the parliament house contains the preserved copies of the originally written constitution. • The assembly members considered the heavy rainfall on the day of signing of the constitution as a good omen.